ดีไม่ดี Little Gem ยังจะสู้แบบใบใหญ่ที่เห็นกันทั่วไปไม่ได้เลย เพราะกลุ่มใบใหญ่นั้นอยู่แดดได้สบายๆไม่เคยมีอาการใบไหม้ให้เ็ห็นกันบ่อยนัก แต่ Little Gem ซึ่งถูกยกย่องว่าทนร้อนได้กลับเป็นต้นที่ยอดไหม้ ดอกเหี่ยวเร็ว และใบเหลืองร่วงบ่อยที่สุดเมื่ออยู่กลางแดด ต้นของน้องแฟนมีใบมากกว่าของ Fiyero เพราะเลี้ยงที่ร่มรำไรครับ แต่ของ Fiyero ให้ดอกสม่ำเสมอเพราะอยู่กลางแดดทั้งวันตั้งแต่เช้าตรู่จดหัวค่ำเลย แดดฝนชุดใหญ่ จัดมา !!! 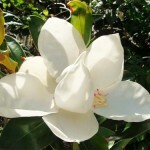 Magnolia grandiflora is a praiseworthy and highly decorative plant. 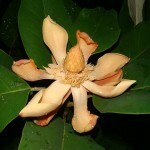 This tree is also known as Southern Magnolia, Bull Bay, Evergreen Magnolia and Great Laurel Magnolia. It originates from south-eastern parts of the United States. Southern Magnolia is famous in gardens around the world for its impressively beautiful foliage with dark green gloss on one surface and rusty felt on the other. You can grow it as a single specimen or as an espalier. 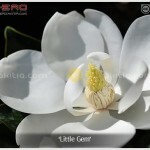 Large, purely white and lemon-scented blooms are produced during Summer. The flower resembles a lotus. 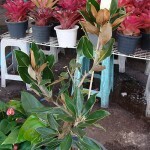 Evergreen Magnolia prefers acidic, rich, moist and well-drained soil. Once established, it can tolerate moderate drought conditions. The tree performs best in full sun and does adequately in a partial shade. It can be propagated by seeds (with cold stratification), grafting and cuttings. Sorry Krub I can’t type in Thai. very shady area under my Jackfruit tree. anyway If you could help me I may share you some of seed. as soon as my stuff arrive to my hand in BK. @ตุลย์ วรางพงษ์ศรี, Sawasdee Krub Khun Tul W.
Thank you for your comment related to this very article. Regarding your question, first of all, do I correctly understand that you mean how to do with the one situated under a Jackfruit tree? 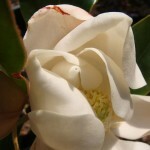 Is it a Magnolia grandiflora as well? If so, it will be just fine to grow in a partial shade as it can tolerate that condition, yet M. grandiflora will not flower as profusely as those in full sun. You can either expose it to full day sunlight or keep it sheltered. Furthermore, do not let the soil too dry or damp as the tree may stop growing or shed leaves and even die. It is strongly recommended that you mix the soil well to have good drainage. I would appreciate it so if you could provide me some seeds. The feature you have just described really interests me. Thank you once again for posting and I hope you are satisfied with my answer. Please do not hesitate to reach me once you have a question.